Some of you have inquired about using different types of paper in the brown paper flooring treatment I’ve done throughout my upstairs. I have only used the brown contractor’s paper (found near drop cloths at Home Depot), but I have seen people use the red rosin paper (also in the same area of HD, I believe). My dad used the red paper in his house not too long ago, so this weekend when we were out there I took some pictures. He has concrete sub floors and followed the poly only method. 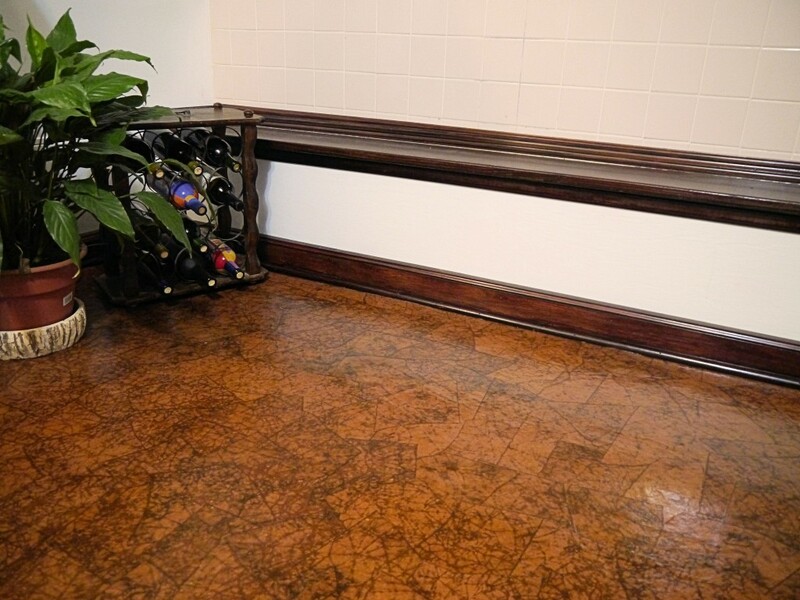 They used Minwax Red Mahogany on the woodwork to compliment to color of the floor (which is not stained). Have you installed brown paper floors? Wow… that is really really really beautiful floor(s). I love how you create something so different that no home is like your. Great job, even if it took you a while to get everything back to basic, it worth it. That is absolutely beautiful. I keep trying to talk my husband into doing this one. I love love love these floors!!! Looks wonderful! I will take a picture of mine tomorrow and upload it. I did 2 rooms thus far. concerete floors, one I satined choc brown, the other is plain. Is that red paper? That is beautiful. I want to do this so bad, but was hesitant because my house is on a slab and all of the subfloors downstairs are concrete. 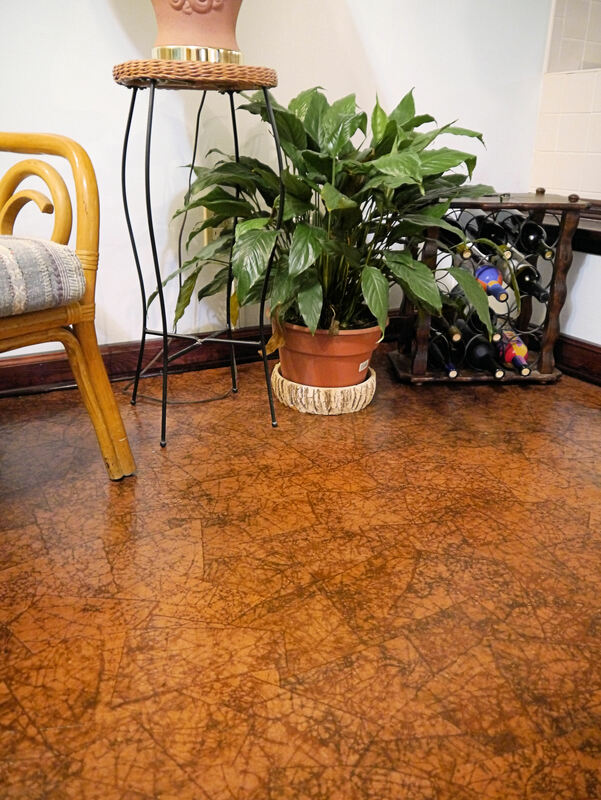 Renee, I would really appreciate pictures of your floors since you have concrete also! Thanks Ladies, you guys are wonderful for sharing! Thank you for posting these pictures. I showed my husband and we plan to do this in our kitchen. Amazing!! Hi Rachael. Thanks so much for posting these pics! I think what I have under my carpet and vinyl is some sort of cement board, so I’m hoping the poly-only technique works on it. I do have a question about the color. From these photos, the floor looks like a very pretty, rich brown. Is that really how it looks using the red rosin paper? I’ve seen other photos using red rosin online and it looks, well, red—too red. I love the color of your Dad’s floor, though. So, is it really the more brownish color it seems like, or did he add something (stain?) to give it that great color? Thanks much for your help. Love love love this! Can you please clarify what you mean by poly only? Does that mean no glue? Thanks so much!!! Jen- Yes, you adhere the paper to the floor with poly, then also cover the top with it. I really like this look. We’re in the process of remodeling our kitchen so the funds are gone but this looks like a great way for me to get my “hard wood floor” for the dinning room. Thank you for sharing the how to do. What type of Red Rosin paper is this because it has very nice brown tones. 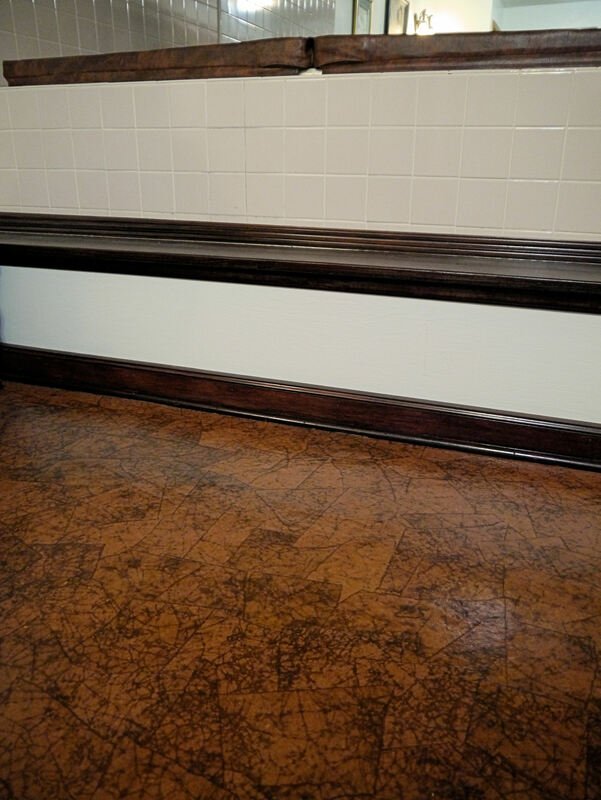 Did your dad use a tinted poly on the floor? Is that the red rosin or the yellowish brown rosin paper? I just want to be sure before I start on mine. It looks absolutely beautiful and would fit my bedroom perfectly. Just tried this with real paper bags cut up and a stain/poly mix. Don’t think it’s going to work. Paper is not sticking to the floor. Did you use adhesive? The instructions I found said to just use one coat of poly then put the paper down. Is the paper bag too thick? Do I need to get a roll of the thinner paper? Or is it the stain/poly mix? Do I need to use just plain poly? HELP! Holly- what type of floor are you installing on? I just started this project last night after much debating and went with the red rosin paper. We cleared out are very large family room about 500 sqft. Carpet out, tack-boards up and holes patched. 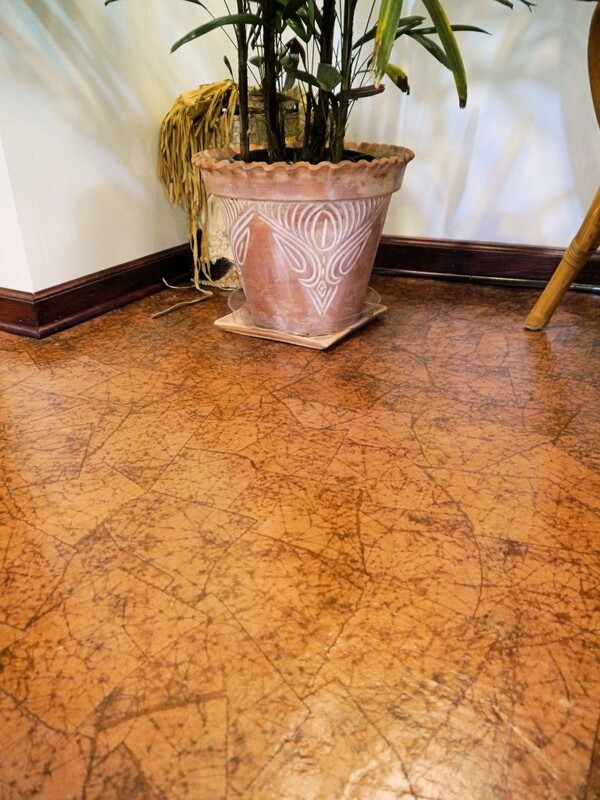 — put a layer of oil based poly on the floor to seal it from any moisture that may come through. This stuff stinks because it’s oil based — we we survived the night with the windows open (in AZ mind you so it’s not that bad) — spent the evening crunching and tearing up paper different sizes keeping in mind to save some edges. We mixed our Elmer’s glue all with a 4 to 1 rations WATER to Glue. Worked perfect started along a long wall and put all of the edge pieces up being careful not to make it look TOO exact in pattern. We’d skip a space here and there so that paper layer on top of 2 instead of constantly being overlapped. we worked out way to the center of the room and backed out way out carefully. We used up the entire one gallon of glue and the best method of dunking them in pain t and squeezing them was the best bet. Lay they down and push out the air. This has kept them flat and just the right amount of texture. Now we are letting them dry over night before we put our clear coats on. yay — I’ll [post more and links to pictures one they are up. Thank you to all of the useful information here it’s incredible. First of all – Thank you so much for your posts and responses to helping first timers make a beautiful home. I can’t wait.